...written by Nissan specifically for the year and vehicle(s) listed. 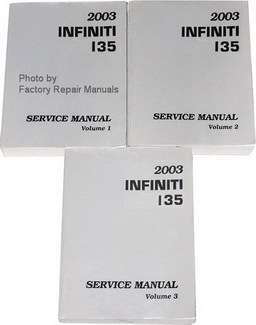 Official Shop Manuals that the dealers and shop technicians use to diagnose, service and repair your Infiniti EX35, FX35, FX45, FX50, G, G20, G35, G37, I30, I35, J30, M30, M35, M37, M45, M56, Q30, Q40, Q45, Q50, Q60, Q70, QX30, QX50, QX56, QX60, QX70 or QX 80 vehicles. A must for anyone who insists on Genuine OEM quality parts. A Factory Service Manual generally covers General Information, Service Information, Suspension, Driveline, Brakes, Steering, Engine Mechanical, Cooling, Starting, Ignition, Emission Controls, Engine Controls, Transmission, Transaxle, Exhaust System, Fuel System, HVAC, Instrumentation & Warning Systems, Battery & Charging System, Audio Systems, Lighting, Electrical, Electrical Troubleshooting, Body Interior and Exterior and more. Wiring Diagrams are also included in most Nissan shop manuals. A Wiring Diagrams Manual (if separate) generally covers Connector Repair Procedures, Wiring Harness Overview, Overall Wiring Diagrams, Fuse and Relay Information, Power Distribution, Fuse Details, Ground Distribution, Component Location Charts, Component Location Views, Vehicle Repair Location Charts, Component Testing and more.